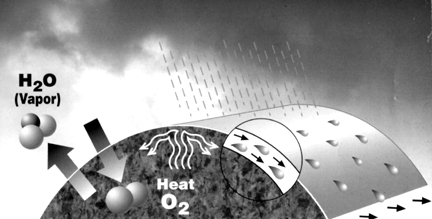 The breathable Compostex TM fabric allows for proper CO2 and Oxygen respiration. Compostex TM Cover * Compostex TM from Global Repair on Vimeo. 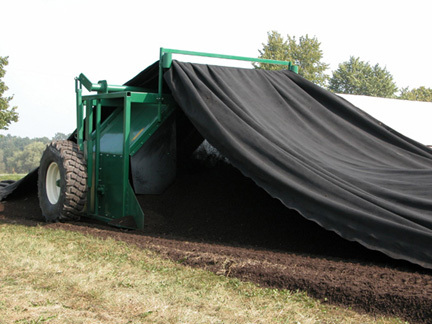 Compostex Windrow Fleece Covers are designed to improve the quality of your compost. The fleece covers are made from a breathable material which allows for air circulation while protecting your compost. 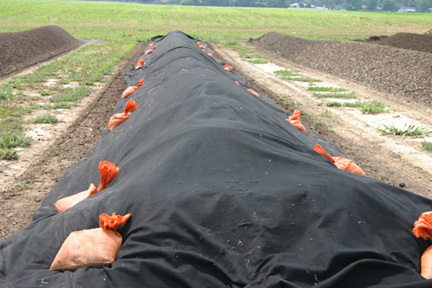 Although the covers are not entirely repellent when placed on a peaked shaped windrow, they will repel excessive water. As microbes are light sensitive, the fleece is designed with UV protection from rays of sunlight. A threading frame allows the operator to raise and lower the CompostexTM geo textile cover. Efficient outdoor compost at a fraction of the cost of under roof systems. CompostexTM is an innovative, protective membrane which covers over the windrow, retaining heat and humidity and shedding excess rainwater. It promotes faster more uniform aerobic decomposition. The CompostexTM cover is light weight, semi permeable, allowing for ideal aeration and inert to acid and alkaline agents. Open ended buildings may be required for areas with excessive rain. and inert to acid and alkaline agents. with a five year warranty. The fleece covers also allow for protection of finished compost stored in fields. As the compost is covered weed seeds and other unwanted debris will not contaminate the finished product. CompostexTM is produced as ordered and available in lengths up to 480 ft(150 meters). Available widths up to 72� (21.96 m) upon request. CompostexTM Fleece covers are made from Polyproylene and are U.V. Resistant. 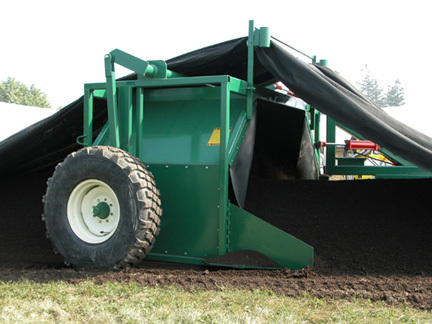 For more information or to order CompostexTM Compost Fleece Covers, Contact Global Repair Ltd. your Canadian Distributor. Sittler manufacturing has been designing and building machinery for over 35 years. Quality, affordable craftsmanship with innovative design.